You are here: Home / Reviews / Subscription Boxes / Pet Gifts: What Do You Get a Dog That Has Everything? I think I bought Chester and Gretel a lot of stuff for Christmas last year. Honestly, they get a lot all-year long. They definitely live a life of abundance. I wasn’t sure what I was going to get them this year. They already have everything. Besides, some of the “gift opening” fun is taken out of it for me when I know everything they’re getting. There’s no surprise and delight there for me. So what kind of gift do you get for a dog that has everything? 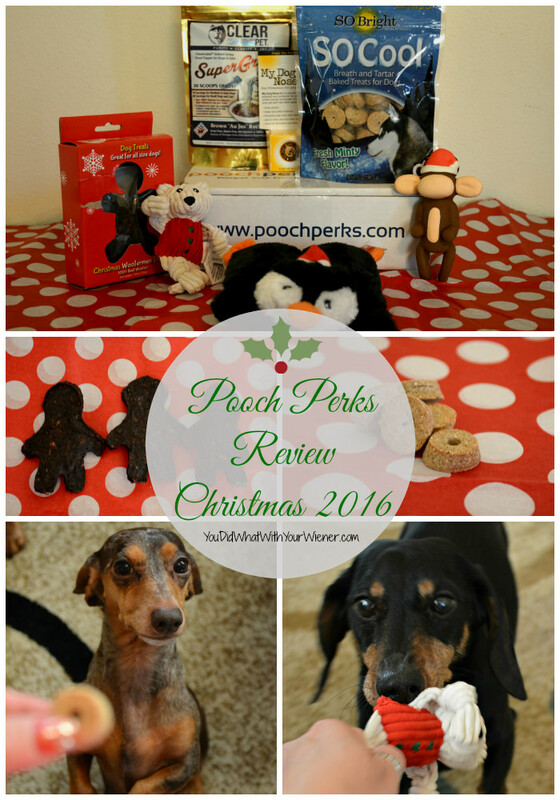 A Pooch Perks subscription box. Pooch Perks heard my pleas of gifting-boredom and kindly sent Chester and Gretel one of their boxes for Christmas. Besides a few treats in the stocking, this was their only present this year…. and none of us knew what would be inside. So, technically, they got 7 surprise gifts this Christmas. This is what was inside the box. 2) Jones Natural Chews Christmas Woofermen Treats – These cute gingerbread-man-shaped treats contain only USA-sourced, all-natural ground beef. These were the first thing Chester ripped out of the Pooch Perks box. They’re oven baked and easy to snap into pieces for sharing. Approximate value $2.25. 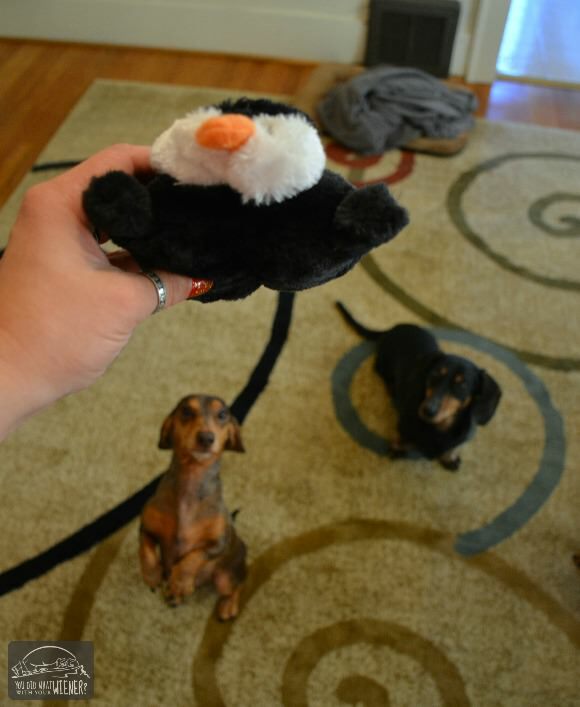 6) ZippyPaws Penguin Squeakie Pad Toy – This stuffing-free has two large Blaster squeakers inside. Chester and Gretel love the loud, long squeak it makes. I think it’s pretty cute. The toy is 6.5″ x 5″ x 2″ so it’s a prefect size for Chester and Gretel – not too big and not too small. Approximate value $5.99. 6) HuggleHounds Knottie Polar Bear Toy – This little bear is crafted in marshmallow-white super-soft ultra-plush corduroy, and bundled up in a cozy red Christmas sweater. There’s a squeaker in the bears tummy and one at the end of each limb. Since this little guy is made to be extra durable, I am hoping it holds up to being chewed and tugged on. We received the week size measuring 6″ x 3″ x 2.5″. Approximate value $9.99. 7) Charming Pet Balloon “Murray the Monkey” Toy – This cute little guy is shaped like a balloon animal and is made of all-natural premium latex (86% rubber material). Given what I learned about the dangers of “plastic” dog toys, I am happy to see that this one passes our safety check. He’s not hollow – there is something slightly firm but squishy inside – and he squeaks. While he is made to be fun, he is not made to be indestructible. I expect Chester to destroy this one first. The small monkey measures 2.5″ x 5.5″ x 6.5″ and its approximate value is $8.75. This is not the first Pooch Perks box we’ve received and, again, I am happy with it. I really like that the boxes have a theme, that all of the treats are made in the U.S.A. (I don’t have to try and find the info on the label), and that the toys are always cute and fun. We were on the fence on the my dog nose it product! But after hearing your feedback, we will go to Petsmart and get some. Thanks!